DESCRIPTION: This plastic replacement dome fits many popular drains including Portals Plus roof drains, Plus Packs and reroof drains. UV resistant Polyethylene. 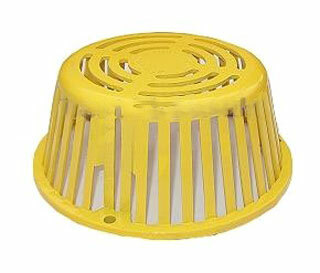 10 INCH CAST IRON REPLACEMENT DRAIN DOME / STRAINER. 9-5/8 OD x 4-1/2 INCH HIGH, 3-BOLT STYLE, EPOXY COATED CAST IRON. REPLACES MOST POPULAR 10 INCH DIAMETER STRAINERS AND WATTS RD1 / 2D DOMES. PRICE/EACH.